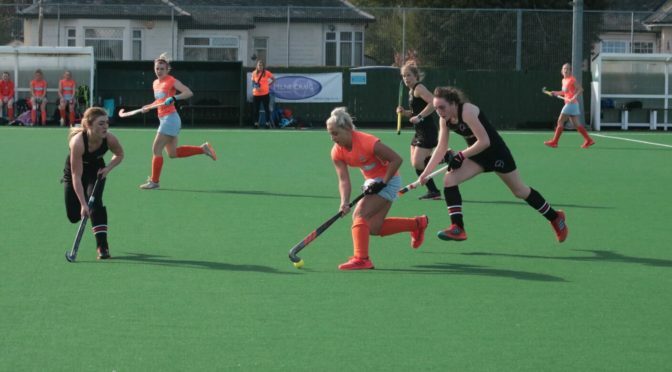 Clydesdale Western 1st XI’s bid to become champions of Women’s National Division One was derailed on the final day after a narrow loss to Dundee Wanderers at Titwood on Saturday paved the way for Edinburgh University to clinch their fifth league title in a row. ‘Dale Western required a win from their final game – a 1.30pm PB against Wanderers. If that had happened, it would have asked the question to Edinburgh University – who played Hillhead at 3.30pm – to have won their game by at least seven goals. The game between the L1s and their Dundonian opponents was never a foregone conclusion, given that Wanderers had won the previous meeting and had drawn the previous Sunday to Uni to give ‘Dale Western a chance to seal glory. Wanderers themselves were also in the hunt but would have the required the unlikely scenario of a large win against the L1s coupled with a Edinburgh Uni loss. The contest itself, was largely end-to-end and saw Clydesdale Western take the lead and take a giant step towards WNL 1 glory through Jen Eadie. But Dundee Wanderers hit back to devastating effect, striking twice without reply through Sophia Free and Charlotte Watson to take the game 2-1. With that result, Dundee Wanderers were still placed below the L1s and only a Hillhead win would have stopped Edinburgh University winning the title. But the students romped to a 9-1 win at Upper Windyedge to seal a fifth league title on the bounce. Despite the results, the club are immensely proud of Clydesdale Western 1st XI in their efforts, not just on Saturday but throughout the entire league campaign. Well done to Dundee Wanderers for their peformance and result from the entertaining contest. And congratulations to Edinburgh University on their league success. Although coming up short on the final day, the club are delighted that their 1st XI Women’s team were part of a day that hopefully showcased the best of women’s hockey in Scotland. Clydesdale Men’s 1st XI secured Men’s National Division One hockey for another season in their final league game of the season after hammering already relegated Gordonians. Hillhead’s 5-1 loss to Uddingston on Thursday night meant that the M1s needed to better whatever their West End rivals result was on the final day. A 4-4 draw for Hillhead against Edinburgh University meant only a win – because of a lesser goal difference – was required for Clydesdale. And they duly obliged as they obliterated their Aberdonian visitors with a ten goal display on a sunny afternoon at Titwood on Saturday. The men who were crucial to ‘Dale’s relentless goalscoring performance were Struan Walker and Andrew Allan, who both scored hat-tricks. Walker actually managed one more than Allan on the day to finish his season with a superb 22 goals to his name. Euan Lindsay, David Nairn and Patrick Lonergan all managed to get their name on the score sheet but it could have been more. A combination of good saves and defensive tackles from Gordonians and some poor finishing kept the home side to ten goals, whilst the away side got some consolation in a goal right towards the end – a well taken pick up and strike by a Gordonians forward past the helpless Sean Mahoney in the Clydesdale goal. The result sees Clydesdale finish sixth in Men’s National Division One for the 2018-19 season, falling short on a top four spot for another season but staying above a Relegation Play-Off fight. Well done to all the Men’s 1s players for their efforts this season. And many thanks to coach Ciaran Crawford for all of his hardwork – especially given he took on the position as coach a few games in to the season. Clydesdale Men’s 2s – like the L1s & M1s – concluded their league campaign for another season with an entertaining draw at Glasgow Green. Against Kelburne 2s, the M2s took the lead midway through the first half after a penalty flick conversion by Scott Lindsay. But the home side rallied to score two, their second on the stroke of half time to give them the lead. The M2s responded in some style after consistent pressure saw penalty corners scored by David Henderson and Neil Fulton within a matter of minutes. The Paisley side did equalise not long after from a penalty corner of their own to set up a grand stand finish. Too much frantic decision making saw both sides unable to convert any chances late on which meant a settlement for a share of the points upon the final whistle. The M2s finish their season in Men’s Regional Division One in 9th place. The M3s narrowly lost out in their clash with Uddingston 3s, losing 3-2 at Bothwell Castle Policies despite a goal each from Ethan Robertson and Christopher Richmond. The M4s lost 3-0 in a late passback at Glasgow Green against Kelburne 5s. The L2s took a big step towards a second place finish in Women’s Championship Division One after beating Waverley Inveresk Trinity 6-1 at Titwood. A brace from Georgia Smith, Anna Hoolaghan and Rhona McGregor all contributed to the scoreline, but it was goalscorer number five that was the story of the game. Such was the dominance in their first half display, the L2s pulled goalkeeper Mairi Fletcher in favour of a kicking back and sent Fletcher up front – and to devastating effect, scoring goal number six for the L2s. The L3s did not have as much luck, however, as they went down 3-0 at home to Uddingston 3s.